Taiwan's ASUSTeK Computer, which produces components for Apple, Dell and HP as well as selling PCs and logic boards under its own Asus brand, has announced the details behind its expected series of tablet sized devices which have been waiting on new software from Google and Microsoft. According to a report by TechCrunch, the company plans to release three families of tablet-style products targeting everything that's already been attempted, with a few new wrinkles. The first product, available later this month for $999 to $1099, is the Eee Slate, a conventional Tablet PC running Windows 7. The device packs an Intel Core i5 with 2 or 4GB of RAM, a 64GB SSD, and a 12.1 inch 1280x800 IPS stylus-sensitive display, making it comparable to a small MacBook Pro without a keyboard. Existing Tablet PCs have never been popular, even after Microsoft attempted to reboot the franchise with last year's Slate PC. While Microsoft promised a variety of hardware partners, only HP delivered anything significant, and its product was a dismal failure. In April, Asus plans to ship the Eee Pad Transformer, a 10.1 inch tablet similar to the iPad, with NVIDIA's ARM-based Tegra 2 application processor and a 1280x800 IPS touchscreen. It also sports front and rear cameras, miniHDMI video output, a miniUSB port, and a microSD card slot. Like Motorola's upcoming tablet expected at CES, the Asus Transformer is waiting for Google's Android OS 3.0 Honeycomb. Asus already outlined that it planned to release a series of tablets, but was waiting for a version of Android that was optimized for tablet use. Like last year's iPad, the Transformer fits into a keyboard dock that "transforms" it into netbook-like device. Unlike the iPad and more akin to the MacBook Air, the Transformer's keyboard base packs an external battery that boosts its core 8-hour lifespan by an additional 8 hours (although unlike the Air, the Transformer detaches in half). The Transformer is expected to cost between $400 and $700. In May, Asus plans to ship the Eee Pad Slider, with similar specifications to the Transformer except with a slide out keyboard. It plans to sell for $500 to $800. In June, Asus will release another tablet called the MiMO, with a 7 inch screen and a capacitive stylus, similar in format to the Newton MessagePad Apple introduced in the 90s. The MiMO will pack a lot more computing power however, with a new dual-core Qualcomm 8260 Snapdragon ARM application processor. The MiMO also includes front and rear cameras and, like the the Transformer and Slider, run Google's Android 3.0. It is said to include a note taking and painting app that highlight the use of its included stylus. While Apple's iPad can be used with a third party stylus, the company itself has eschewed any promotion of stylus features, with its chief executive Steve Jobs introducing the new iPhone in 2007 centered on touch, not a writing stick. "We are all born with the ultimate pointing device -- our fingers," Jobs said, "and iPhone uses them to create the most revolutionary user interface since the mouse." Apple's success with the iOS caused Microsoft to eventually rethink its own stylus-based Windows Mobile operating system, which it finally replaced last fall with Windows Phone 7, using a touch-based user interface pattered after the iPhone's direct multitouch experience. Google's Android has similarly moved away from the mini-button Palm OS and BlackBerry-like phone designs it originally intended to deliver and has since 2008 instead adopted the full touch screen design of Apple's iPhone. This year, Android 3.0 is similarly expected to expand Google's platform to better fit iPad-like tablets. Whether Asus can resurrect the stylus and make mini keyboards popular among tablet users remains to be seen. The company's PC volumes exploded under dramatic growth of netbooks in 2009, quickly making it the third largest PC maker. However sales of netbooks have cooled and growth within the netbook segment has gone negative ever since the release of the iPad last April. When iPads are figured into PC sales along with netbooks, Apple becomes the third largest mobile PC maker, behind HP and Acer and ahead of Dell and Toshiba. These look pretty good. Asus makes good stuff. 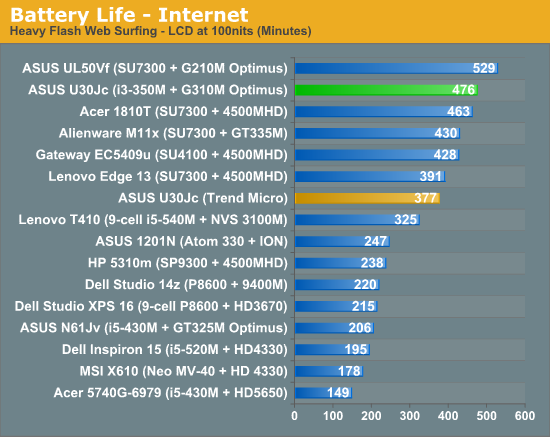 AnandTech stated the duration of the Core-i5 tablet running Windows 7 was 5 hours under normal use with a 30Wh battery. That?s pretty damn good for Windows. I assume that their Android versions will be considerably better. So when will Honeycomb drop? To put another way, how long after the iPad 2 drops? Hmmm, a laptop with a detachable touchscreen that runs crappy software. waiting on new software from Google and Microsoft. Yep, the problem is these guys don't make both the software and hardware so their products are never as good or polished as Apple's stuff. Apple is built from the ground up software and hardware together. Take the rumors that the Galaxy Tab won't be able to run the new Android Honeycomb OS properly as it requires a dual core chip. And the Tab is very new, Samsung possibly didn't know the requirements for Honeycomb or didn't care. And the Rim playbook has battery issues as QNX OS was actually designed for plugged in devices. Okay.. The hardware is not bad. How they'll do with Honeycomb remains to be seen. The "competition" is getting more interesting, which is good for everyone... mind you, you'll never catch me using one of these things. AnandTech stated the duration of the Core-i5 tablet running Windows 7 was 5 hours under normal use with a 30Wh battery. That?s pretty damn good for Windows. I think these devices miss the point of a tablet. A tablet brings the idea of being one-piece, solid, integrated. The iPad keyboard dock is not touted as part of the product itself, it's an accessory. This Asus device just feels like a laptop that snaps in half. The slide out keyboard one is potentially nice, but how would you rest it on something to work? Why would you? You want these in one hand while you touch them with the other, not balancing it to use a keyboard. Crucially, people aren't looking for a tablet for having a tablet's sake. The iPad has eaten into netbook market share, i.e. low-price laptops. For the prices of these Asus devices, people will just buy laptops. There'll be people who like these, but I don't think they'll be big sellers personally. What is this nonsense about Android phones as "iPhone clones"? What does that have to do with anything? Does the person who wrote this article have any professionalism? I love Apple as much as the next guy, but it is not necessary to belittle the competition when you write an article. Leave it to the commentators. Does the person who wrote this article have any professionalism? The author is Daniel Eran Dilger, so, no. He's a notorious fanboy. What is this nonsense about Android phones as "iPhone clones"? What does that have to do with anything? Does the person who wrote this article have any professionalism? I love Apple as much as the next guy, but it is not necessary to the belittle competition in when you write an article. Leave it to the commentators. 1) I have no idea what they were doing to get 5 hours, but I also have no reason to disbelieve them. Note that Asus gets phenomenal battery life with top ranking displays out of them net/notebooks. 2) I’d think the tablet with the built in physical keyboard will stand up when put on a flat surface, like a desk. This is $499, the same price as the iPad for a 16GB storage and 512MB RAM. This could very well replace a full sized PC for many casual users. 3) I asked this question in another article today before these came out: Will tablets announced at CES force analysts to alter how they define ‘PCs’ if they can completely replace a ‘PC’ for basic users? Two of these Asus tablets could be the only ‘PC’ users have in their home and they start at $399 (plus keyboard dock cost) and $499. PS: Note that the 7” Asus tablet starts at $499 and the 10” without the sliding keyboard starts at $399. I wonder where the extra cost is coming from? It's such a shame that a story worded like that would be allowed to be posted on a professional website. But tell that to any major news outlet. 4) Note that the 7? Asus tablet starts at $499 and the 10? without the sliding keyboard starts at $399. I wonder where the extra cost is coming from? The display... they have to pay someone to steal them from Apple's supply chain. It's at a premium price. Does this mean we'll be looking at a 1200 x 800 iPad2 display this April? I do have to admit that these things look pretty good. However, movie sets look very good when you're looking at them from the camera's perspective. I would enjoy checking these out! Please don't feed the BLINDINGLY OBVIOUS trolls, thanks. I think it's great Apple is getting more competition. It will only cause them to get better, really. I'm with Johnamac on this one. I've been provisioning and fixing computers for many years and I doubt that five hour figure very much indeed. Generally speaking if Apple says a battery gets 5 hours, it really gets about four, but if any other manufacturer says they get five hours, it's typically really about two or three at most. I know that's a very big generalisation, but I've found it to be mostly true over the last five years or so at least. Apple's battery tech and power management is the best by a country mile without exaggeration. The only reason the average non Apple-owning consumer doesn't know this, is because the other manufacturers lie so regularly and reliably about their figures that most people just assume Apple is the same. If any of these competitors makes something smaller than an iPad I'll be interested. If it runs something besides Windows 7 or Windows 7 Mobile I'll be even more interested. I was at the store a couple of weeks ago and was looking at the Barns & Noble Nook and the Sony e-readers. The Sony screen was about six inches across diagonally. It fit into my single hand very well. I could hold it in my palm. I liked the way it fit. The Nook was bigger at about seven inches diagonally. I could hold it in my palm but my fingers were very spread out trying to grasp it on both sides. My point being that I'd love to have a small iPad or other tablet with quality apps about the size of the Sony e-reader. I'd like it to not have so many buttons along the sides. Having a slide out keyboard would be OK if when it was placed on a table it didn't rock around when typing. There are some people who use two fingers to type very fast. Having a keyboard on a small tablet would work if the keyboard worked well. The touch screen keyboards aren't very accurate when touched. Often I've had to touch an iPad screen more than once to register a letter. The same goes for an iPod Touch. The tactile feel of a mini keyboard might give better clues about whether the letter was truly pressed compared to a touch screen. The thing I don't trust about Google OSs is that they don't update well and that some of their previous hardware can't be upgraded with the latest version of their software. That's why I'm more interested in what HP will bring out with the Palm OS or whatever company they just bought can come up with. Oh come on! You are a brand new account but imply that you've been here before. Your name is "hahaha" and all you ever post is one liners full of hate and bile. You're the very definition of a troll and clearly someone who has been banned and is just coming back here to grief everyone for kicks. Since I don't like to encourage your type, this will be my only comment to you so feel free to flame away if it makes you feel important (and I know it does). I have heard report after report that dealing with ASUS on anything is akin to yanking all of your teeth out of your skull. I misread Jared Walton of AnandTech’s comment. He believes, based on previous Asus notebooks, that they should be able to get 5 hours from the Windows version with a 30Wh battery. Here is one of their images from testing of Windows notebooks. Asus does care about battery life. The bottom line is this a 12.1” display with no HDD and a 1.33GHz LV Core-i5 processor could get 5 hours from a 30Wh battery in the same tests. I see no reason why Jared would be lying or how he is blatantly wrong. If the Asus U30jc in the image above with a 2.26GHz Core-i3, NVIDIA GeForce 310M Optimus GPU, 13.3” LCD (though not IPS) and HDD can get 8 hours of internet use from an 84Wh battery then why can’t this Asus tablet with a 30Wh battery get 5? PS: I’ve found Apple’s battery life ratings to be as good or slightly better for normal use. The only other vendor I know of that rates in the same way is Sony.